« What sets Avigilon apart from other HD IP CCTV systems. Spread over 11, yes that’s 11 Halls, Essen needed a transport system of its own inside just to get us from hall to hall ! Talking of transportation, the travel system, namely the hugely efficient DB Train system, delivered us on time every day – if the platform board showed 1 minute until the next train, 1 minute it was! Anyway, back to the show. Notable massive stands (or booths as our European friends referred to ) were Bosch, Honeywell, Siemans. Bosch had their representation of an aircraft, complete with actual airline seats to sit and listen to the presentations! Rumour has it (and only rumour because we weren’t invited!) that all visitors to their stand (oops, booth) were taken out to the back of the Bosch area and treated to a full 3 course cooked lunch!!! Now that is customer care! Interesting that their flagship new MIC 550 was represented by one, solitary lonely looking model on top of one of their product podiums……. The British contingent were represented in the BSIA section by the likes of GJD with their HD CCTV lighting solutions, Elmdene and NVT. Also present for the first time at ESSEN was 360 Vision Technology, brave guys taking their range of Predators into the back garden of Bosch MICS!!!! Talking of 360 Vision, they certainly flooded their stand with multiple-coloured Predators! Gold, orange, green and JCB Yellow ensured that sun glasses were needed for this UK manufacturer! Into Hall 2 and the mighty Geutebrueck had an amazing stand – packed with staff and visitors it seemed for the full 4 days! Some great video Analytics were observed over at the UDP Technology stand – fully expecting these guys to be taking the UK by storm real soon with their very clever technology! MP was represented amply by the usual guys – Arecont and Avigilon had excellent displays. We spotted Todd Rockoff at the show as well spreading the word about HDcctv . Keep watching this space for more news from Todd soon. Visitors attending the show were from far flung regions – talking with some of the exhibitors, they had seen good quality leads from US, Asia, Australia, New Zealand, Middle East and of course the main Euro regions – affirming Security Essen’s status as a truly International show. It therefore must beg the question, with such a high quality show held only every 2 years, is there now room for a smaller, certainly less well presented IFSEC anymore in the UK? We paid fairly low airline fares to Dusseldorf, stayed in a clean, functional but inexpensive hotel (compared to London or Birmingham hotels) and travelled effortlessly, cheaply and efficiently on excellent transport to and from the halls. Our opinion? 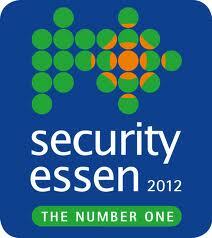 Security Essen is the show that is worth visiting……and waiting for! This entry was posted on Thursday, October 4th, 2012 at 09:05	and is filed under Access Control, Analytics, ANPR, CCTV, Digital Recording, HD SDI CCTV, HD SDI DVR, HDCCTV, Integration, Intruder Alarms, IP cameras, IP CCTV, Predator CCTV camera. You can follow any responses to this entry through the RSS 2.0 feed. Both comments and pings are currently closed.